ESR | September 9, 2002 | The NEA's at it again! The NEA's at it again! The routinely liberal National Education Association is yet again steeped again in controversy. 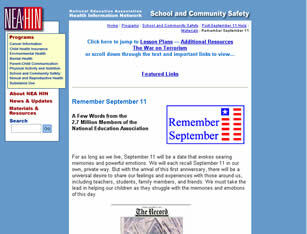 This time it's about NEA's "Remember September 11" web site, "to help parents and educators deal with the range of issues children may face ...The site's main feature is the more than 100 age-appropriate lesson plans submitted by NEA members and selected by educators." Apparently the NEA feels that the association "has a special role to play in helping our young people prepare for the world outside our classrooms, and we are honored to teach the values that make America strong"
"The site has been subjected to some criticism by those who have taken the material out of context. Using this national tragedy to attempt to score political points is a new low, and we urge visitors to make their own assessments of its value. We are confident that most will find the site quite useful in helping our young people cope with the aftermath of the Sept. 11 attacks". But in "Tips for Using the Lesson Plans," here's what teachers find. "Be aware that you will not be effective if you purposely or inadvertently take one side over another in controversies of a political, religious or other nature, including taking the side of one student over another. When you model respect for and tolerance of all the views and feelings (anti-American views as well, right?) that your students share, your students will try to do the same." With statements like that and others, is it any wonder that a number of people are less than thrilled with the NEA's efforts? And it gets worse. In a story in the Washington Times, reporter Ellen Sorokin writes "The National Education Association is suggesting to teachers that they be careful on the first anniversary of the September 11 attacks not to suggest any group is responsible' for the terrorist hijackings that killed more than 3,000 people." Strictly speaking, while the quote is accurate (see the following extract, which I have reprinted in entirety for the sake of context), and there is a link from the NEA page, it's not the NEA that's directly responsible. The quote in question comes from an article on the National Association of School Psychologists web site and a piece titled "A National Tragedy: Promoting Tolerance and Peace in Children. Tips for Parents and Schools." Here's the sentence (underlined and in context) that's been causing all the controversy. "Explore who and what may be to blame for this event. Use non-speculative terms. Do not suggest any group is responsible. (Author's emphasis). Do not repeat the speculations of others, including newscasters. Do not encourage or allow random blaming; but understand that self-blame may be a way for students to feel in control' (something different they could have done' or could do' in the future). Be careful to ensure students, (e.g., Arab-American students,) do not assume blame in order to make classmates feel better. Blaming is especially difficult in terrorist situations because someone is at fault. However, explain that all Arab-Americans are not guilty by association or racial membership. Help kids resist the tendency to want to pin the blame' on someone close by. In this country, we still believe that all people are innocent until solid, reliable evidence from our legal authorities proves otherwise. Further, we have no reason to believe that the attacks on our country were part of an organized plan of any other country. The terrorists acted independently without the sanctions of any nation." Do NEA administrators think that patriotic Americans are going to respond positively to verbiage like this? Encouraging teachers to respect every viewpoint held by their students (presumably that includes terrorist views as well) and not to assign blame to any group for the terrible events of 9/11 is tantamount to treason against the United States. It's also grossly insulting to those who lost loved ones on that terrible day and especially totally inappropriate in the days leading up to the first anniversary of 9/11. We know who was responsible for 9/11. It was radical Islamic terrorists from Saudi Arabia who believed they'd gain a special place and favors in Islamic heaven as a result of their evil acts. Why is it that groups such as the NEA and the NASP have no difficulty in assigning blame to America but find it absolutely impossible to attach blame to any other country or culture? I don't know about you but I'm getting really tired of the unpatriotic attitude of the NEA and other like minded groups. I hope you'll let the NEA know what you think by contacting them at feedback@list.nea.org. There's not a better time to do it than right now!